Pakistanis are an opinionated people; from fruit vendors to domestic workers, all are as articulate in politics as any academic or political analyst. But these opinions vary, and they vary drastically on almost every major issue confronting the country. Be it Malala Yousafzai, Imran Khan or even kite flying, we hold extreme, polar opposite views on each matter. The recent judicial activism of the Supreme Court, demonstrated by the Honourable Chief Justice of Pakistan, Mian Saqib Nisar, is no exception. There are, as usual, two sides – one fervently supports the actions of the Chief Justice, while at the other end are those who criticise him for bringing the superior judiciary in disrepute. Let us discuss how these diverging fault lines came to appear. It began with the verdict of the Panama case, with the nation divided as to the authenticity of the judgment. Some called it an unprecedented landmark decision that would lead to the elimination of corruption and exploitation from our society, whereas others bemoaned it for being a travesty of justice. 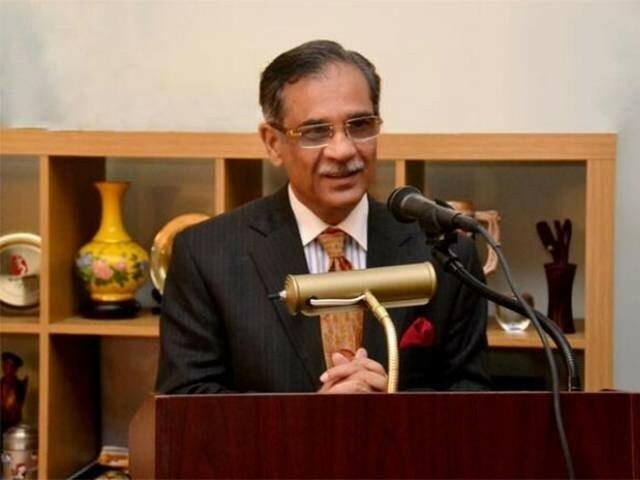 Once the Supreme Court had adjudicated upon Panamagate, the Chief Justice started to focus on social welfare issues, including the provision of basic facilities such as clean drinking water, improving healthcare facilities and the educational structure of legal and medical professions in Pakistan. These actions have had a divisive effect as well – there are people who say he is a beacon of hope for the people, and then there are those who are calling him out for interfering in the domain of other institutions. It is noteworthy that both sides hold some merit in their respective arguments. Those who support the actions of the Chief Justice are right in pointing out that were it not for his suo motus, no one in the government would have paid any attention to the miserable conditions of public hospitals throughout the country. To take one example, in Sindh, the duo of the Pakistan Peoples Party (PPP) and the Muttahida Qaumi Movement (MQM) has been ruling Karachi for the last 30 years. Yet, both parties have failed to resolve the water crisis of the city. But no one cared, no one took notice, and no one was held accountable. It was the current Chief Justice who raised this matter, grilled public officials on their apathetic approach towards their duties, and sought immediate reports on the provision of drinking water to the City of Lights. He is being admired because there is no one besides him who is taking up these issues with the government. Perhaps the indifference of provincial governments to the plight of the masses stems from the lack of appreciation on part of the people over the importance of their vote. Due to intermittent derailment of the democratic process in the country, Pakistanis have not been able to fully grasp the notion of living in a democratic society. A society where those elected to govern are answerable and accountable for their actions, and where town hall meetings are a norm so the link between politicians and constituents remains intact. In the absence of these systems, someone had to take up the mantle of speaking for the silent, and bringing to light issues that have deliberately been brushed under the carpet for far too long. This is where the Chief Justice’s role is so admirable. On the flip side, the reasoning states it is not the judiciary’s role to tell the elected representatives of the people how to govern. If there are issues, the government will deal with them. It is said the judiciary’s recent activism is in fact an intrusion by one organ onto the affairs of another, which is causing harm to democracy in the country by giving a bad name to the executive and legislative branches of the state. Secondly, fingers are raised towards the Chief Justice to first put his own house in order before blaming others for incompetence. The fact is that the lower judiciary is suffering from numerous problems inhibiting speedy justice, including century-old, worn out civil and criminal procedural laws, a culture of adjournments, ineffective case management, and pervasive corruption. All of these factors have combined to utterly tarnish the image of the courts, so much so that an aggrieved person would think twice before approaching the court of law for relief. However, what was heartening to observe was how recently, while speaking at a judicial gathering in Quetta, the Chief Justice was swift in accepting this argument as fair, and vowed to bring cogent legal reforms in the judicial system to address this issue. This acceptance of fault holds great significance for the nation, because rarely do we see the head of a state institution openly admitting the shortcomings of his organisation, and it is only when one admits a fault can they go about fixing the problem. Of all the Chief Justices of Pakistan in recent memory, the incumbent seems the most determined to actually bring about significant change in the system of justice. Although the Chief Justice has rejected the criticism of his approach in belting out justice with a stern hand, if he is able to succeed in this epic reformatory mission, he would be doing the nation an incalculable favour for generations to come. On the other hand, since every coin has two sides, if he does not live up to this promise of re-structuring the judicial organ, it is inevitable he may well be remembered by the masses as the “Panama Judge” who spoke of lofty ideals of change but was unable to translate that vision into anything meaningful. issues. Brought on by these corrupt, incompetent thugs called ‘public servants’. and looting. and have brought the country to it’s knees, to the brink of disaster. Near bankruptcy. There is no water, there is no electricity, there is no law and order. Living from loan to loan. On scraps that China throws. Taking one loan to pay off another. govt. and he is still not in jail and is roaming free, then things are dire indeed. A bunch of religious zealots can shut down a major city any day. They have done so twice, already. The Govt. with hat in hand, obliged them, twice! absconded to London. Living in luxury there, while the Paks pay is “medical bills” !! Well, er, hmm, see, huh, there are only 24 hours in a day. and 7 days in a week. 70 years! The Honorable CJP is working 7 days week! What more can he do? If there is a day off, the CJP is going over/preparing to hear next week’s cases. Rest assured that the cabal is making every attempt to clog the wheels.